Sarah slashes down the days to her summer vacation trip with all the gusto of Zorro and his infamous 'Z', until she discovers her best friend's plot to end his life while she's away. “That was the first of hundreds of conversations between us. Most came easy. And some a little harder. It’s not necessary to have a bunch of overwhelming special effects to make a great film. Or well-paid world-famous movie stars to embellish the whole. Or an intriguing story with a magisterial end. Sometimes there are films where the message leaves an overwhelming impression. As in “Just say goodbye“. Even though you clearly notice at the beginning it’s a low-budget film, it convinces after a certain amount of time. Personally, I have never known anyone who’s in a similar situation as Jesse (Max McKenzie). Jesse’s youth can hardly be called rosy. First of all, there’s his mother who committed suicide. And then there is Jesse’s father (William Galatis). A hateful person with a drinking problem who’s constantly reminded of the incident when he looks at his son. In addition, there’s also the constant bullying at school. All this ensures that Jesse has a fairly fatalistic view of life. The only positive thing in his life is Sarah (Katerina Eichenberger). A friend who looks forward to a holiday and marks the days on her calendar daily. She doesn’t realize that Jesse is also counting down to another climax in his life. The facts about suicide are horrifying. 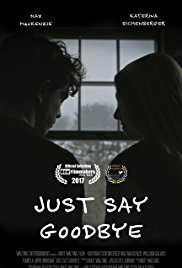 “Just say goodbye” deals with a sensitive topic. The fact that we live in a narcissistic society, where individuals become more and more isolated and alienated from their environment, it’s important to draw attention to this. For many who are fortunate enough to be in a situation where the outlook is more positive, this will generate an I-really-don’t-care feeling. Until the moment that fate strikes in their immediate environment. And more than once the remark will be made they didn’t see this one coming. And also that they didn’t think the person in question would be able to carry out this act of desperation. I think when it comes to suicide among teenagers, we are at one minute to midnight. When googling about this subject, you find some disturbing facts. In most countries, it’s even the number one cause of death and one speaks of three suicides per day. To talk about it with young people is essential. And it’s films like “Just say goodbye” that are a perfect tool for this. It’s not a happy let’s-have-some-fun movie. “Just say goodbye” broaches this topic in a serene way. There was no unnecessary use of sensational imagery. In a truthful way, it showed, on the one hand, the defeatism of someone who no longer seeks a way out and no longer has the will to live. The despondency is constantly present. On the other hand, there’s the struggle of a good friend to turn the tide and who’s willing to do anything just to show this person that life also has its good sides. Even offering herself in a sexual way is one of her attempts. It’s not a joyful film. Far from. Even though I knew it was an Indie low-budget film (it was made with a limited budget of about $13K) and certainly didn’t expect to see some impressive visual material and acting from the top shelf, I had to admit that it actually all looked professional (even though the second cameraman caused ripples in the water, so I could already guess from where the next shot would be taken). The acting of both Max McKenzie and Katerina Eichenberger felt genuine and credible. The two perfectly complemented each other. Two good friends who cared about each other and had their romantic moments. Without any doubt, it’s the most admirable part of the film, even though the interplay wasn’t 100% fluent and felt a bit forced sometimes. Also, Jesse Walters as the bully Chase deserves a mention. Even though he’s a textbook case of an average bully which can be found in every school. A pampered teenager who, thanks to his wealthy parents, gets everything and treats others in a patronizing way. He’s that kind of person I utterly hate and preferably would like to pull through a heavy plate mill. The rest of the cast consists mainly of adults who, in my eyes, didn’t have a central role to play. Which is also obvious, given the subject. Don’t ignore obvious signals of despair. There were a few minor flaws in my opinion. For example, I thought Sarah’s plea to Chase, to cut Jesse some slack, was rather short-sighted. As an intellectual and compassionate girl, she should know that this would only have a counterproductive effect. The additional storyline about Chase I found quite far-fetched and superfluous. The only use it had, was to give an explanation for the suicide of Jesse’s mother. But apart from that, this film still left an impression. Not only do we see how desperate those are who are out of touch with their environment and want to give up. But also the despair of those who stay behind is noticeable. A clear signal to parents not to ignore signals from their children. “Just say goodbye” is a film with a sensitive subject, leaving a crushing impression. And finally, I think it takes courage to make such a film.